1995 seems awfully recent for a 'Heritage Series' recording. But then, the recording industry has changed almost beyond recognition in the last 15 years, and there is a certain sense here of a window onto the past, even if it is a past that is well within most opera goers' memory. Conductor Andrew Davis, performing in the days when he was a regular fixture in the Covent Garden pit, that's one aspect of the nostalgia here. His take on Rosenkavalier is slightly paradoxical. His attention to detail is everywhere apparent, although you sometimes get the sense that the woodwind soloists are not delivering the precision he is hoping for. More significant though, are the conductor's competing desires to maintain the musical precision and at the same time keep the momentum and flow. His waltzes are great, and every time Strauss strikes up the next dance, Davis is able to whip up a storm from the orchestra. Elsewhere, the drive sometimes flags, and the textures occasionally become staid, as if an English reserve is creeping in despite the performers' best efforts. All of the singers make distinctive and worthwhile contributions. 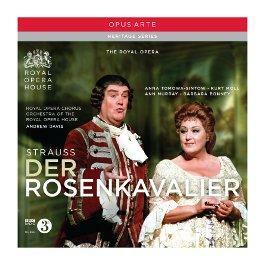 On disc, this opera is best known through studio recordings, particularly the Karajan and the Solti. Technical issues aside, the big difference between those and this live staged performance is the way in which the singers inhabit the characters. Ann Murray as Octavian really makes the most of the disguises, which come though in the timbre and dialect of her singing. She takes it a little far at times, and her tuning occasionally sufferers. Kurt Moll also puts in a dramatic turn as Ochs, but musically his performance is more understated. He has a great voice for the part, a rich, almost sinister tone, but its not a loud voice, definitely more Strauss than Wagner. Anna Tomowa-Sintow is another impeccable Straussian. Her Marschallin is a little wobbly for my taste, but the wide vibrato is certainly stylistically appropriate. And each of her set pieces, especially the ending, are exquisite. Barbara Bonney is a good, if unexceptional Sophie. Slightly less vibrato from her, but just enough to allow the ensembles to cohere. Is this a digital recording? The packaging doesn't say one way or the other. A recording of Meistersinger which was also made by Radio 3 in the same era was released by Royal Opera a few years ago, and that was from an analogue master. Why the BBC were still using analogue tape into the 1990s is a mystery to me, but I suspect this might be from a similar source. The sound is reasonable for a live recording, but it is not great. There is little clarity to the orchestral textures, and the sound from the pit is often boxy and constrained. Similarly on the stage, solos are usually clear, while ensembles lack clarity. Having said that, the stereo array is good, and you really get the sense of stage action from the placement and movement of the singers. A serviceable Rosenkavalier then, but not an exceptional one. The fact that it is a live, staged recording brings important benefits, not least of which is the sense of atmosphere, of occasion even. But many of the things that a studio set-up can bring to the work are notable by their absence, the occasional need for a second take for example, and the balance at the back of the orchestra. I would struggle to recommend this over either the Karajan or the Solti. However, if you have been listening to those continuously since you first bought them on vinyl, then this could prove a refreshing alternative. And when it comes to those waltzes, Andrew Davis is as passionate a conductor as any.